Washington -- At a rally in Wisconsin on March 30, President Bush came down hard on Democrats for supporting an increase in the 18.4-cent-a-gallon federal gasoline tax, which finances highway building, mass-transit projects and safety programs. As a six-year surface transportation bill moved through Congress, Bush said, "There are some in the other party in Washington who would like to raise gas taxes. I think it would be wrong. I think it would be damaging to the economy, not positive to the economy." The president was right that some Democrats favor a modest increase. But so do some leading Republican lawmakers. Rep. Don Young of Alaska, a Republican who chairs the House Transportation and Infrastructure Committee, has been leading a crusade for sharply increased transportation spending, to be funded by an immediate nickel increase in the tax, followed by annual increases of half a cent. The last increase was in 1993. The extra revenue would go to the Highway Trust Fund. Young argues that the spending would create hundreds of thousands of jobs. He is supported by top Democrats on the committee -- and by Republican Rep. Thomas Petri of Wisconsin, who chairs the committee's panel on surface transportation. 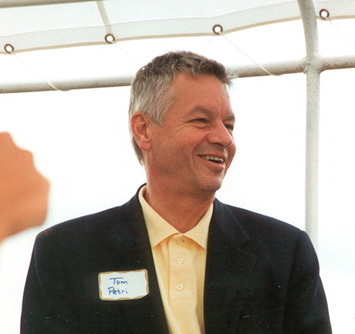 Petri's long record of fiscal conservatism has won him endorsements from groups such as the National Taxpayers Union and the Concord Coalition, which advocate fiscal responsibility. Petri told the House Rules Committee last week that he favors annual increases in the tax -- which he called a "user fee" -- to make up for the inflation-eroded buying power of the dollars raised for the Highway Trust Fund. A $275 billion surface transportation bill approved overwhelmingly by the House of Representatives on April 2 did not include such an increase. Neither did a $318 billion Senate version approved earlier. With gasoline prices at their highest levels in years and an election just months away, a tax increase appears out of the question this year. Bush recently attacked Sen. John Kerry of Massachusetts, his Democratic opponent, for once favoring a 50-cent-per-gallon increase. Kerry's campaign responded that while he did mention such a potential increase in a 1994 newspaper article that also discussed possible tax cuts, he never voted for it. At the state level, however, there has been considerable bipartisan support for increases. Since 1997, 14 state legislatures have voted to raise their state gas taxes a total of 17 times, according to a study by the American Road & Transportation Builders Association. Many Republicans have expressed dissatisfaction with the $275 billion House bill, saying their states are shortchanged by a federal highway aid formula. The House rejected an amendment to reallocate funds within the bill, raising the possibility that, ultimately, higher gas taxes may be needed to raise sufficient revenue to fix the problem. The Senate's transportation bill spared senators from voting on the gasoline tax issue. It readjusted the formula, using extra funds raised through a series of fiscal devices. But the White House has threatened a veto, citing the cost and various financing gimmicks.